“It’s better that the disabled disappear,” the police further quoted him as saying. 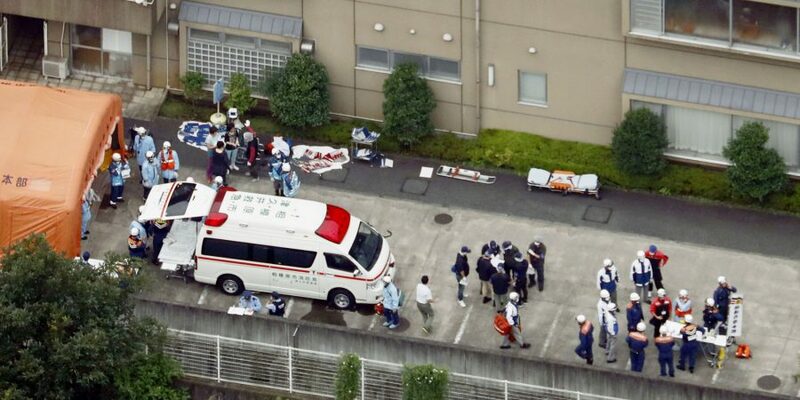 The police said Uematsu, a former employee of the facility and a resident of Sagamihara, showed up at the station with three bloodstained knives in a bag. The police initially arrested Uematsu, who is currently unemployed, on suspicion of attempted murder and unlawful entry. The initial inquiries came from journalist friends, and from friends resident in Japan that were disabled or had disabled relatives, some of the latter were Japanese and some were non-Japanese. All whom inquired wanted to know what I thought this attack said about the attitudes towards the disabled in Japan. “According to sources related to the Lower House, Uematsu took a letter to the official residence of the Lower House speaker in Tokyo’s Chiyoda Ward on Feb. 15. According to police investigators, the letter listed several facilities, including Tsukui Yamayurien, and threatened that some residents would be killed. The letter also demanded that the Diet pass a law promoting the euthanasia of disabled people. The Lower House reported Uematsu’s letter to the Metropolitan Police Department in Tokyo. On Feb. 19, the Tsukui Police Station, which had been notified about the threat from the facility, questioned Uematsu. At that time, he made the same threat. Police reported the case to the Sagamihara city government on the basis of the Mental Health Law. The city government forced Uematsu to submit to mandatory hospitalization after undergoing a medical examination. On Feb. 20, the hospital detected the presence of marijuana in Uematsu’s blood and urine tests. Since the Sagamihara attack I have been thinking a lot of an another attack, commonly referred to as ‘The Osaka High School Massacre’, when, On June 8th 2001, a janitor, one Mamoru Takuma, killed eight high school students in Ikeda, Osaka, wounding children and teachers. Takuma was found to have mental health issues and was executed for the murders on September 14th 2004. Very few people asked at the time whether Takuma’s stabbing of students ‘said something about the attitudes in Japan towards high school students’, but yet many ask the question whether what Uematsu did speaks to some ‘anti-disability attitude’ prevalent in Japanese society, that this was a kind of ‘disability hate crime’. As person with a physical disability, married to a Japanese person with a physical disability, I am somewhat sympathetic towards disabled people in Japan that may feel threatened by these events, that feel that disabled people are in general, being attacked as a social group, and see Uematsu’s actions as a symptom of such attacks. However, I ultimately view the situation slightly differently; I see the stabbing in Sagamihara as a failure, of mental health care. Instead asking ‘what does this say about attitudes towards people with disability in Japan?’ perhaps, we should ask instead, how can mental health services in Japan be improved to prevent such things happening again?